Extensive Reading helps students to build reading fluency, broaden knowledge of vocabulary and collocation, and gain confidence. Vocabulary Building offers strategies for independent vocabulary learning such as dictionary work, guessing meaning from context, and learning how words work in sentences. Comprehension Skills teaches reading skills such as recognizing words and phrases, scanning for information, and making inferences. Thinking Skills provides practice in recognizing sentence structure and following the logic of ideas. 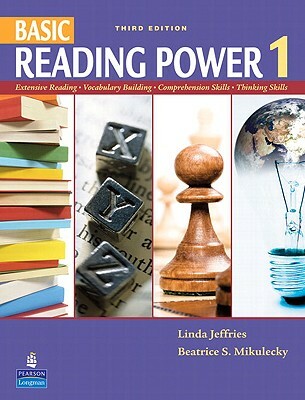 Author Name: Jeffries, Linda, Mikulecky, Beatrice S.
Description: illustrations 224 Basic Reading Power 1 is a new and updated edition of the successful student-centered reading skills textbook Basic Reading Power. Its unique structure, featuring four parts to be used concurrently, allows beginning-level students (with a 300-word vocabulary) to develop the multiple sills and strategies involved in the reading process. Overview *Extensive Reading helps students to build reading fluency, broaden knowledge of vocabulary and collocation, and gain confidence. *Vocabulary Building offers strategies for independent vocabulary learning such as dictionary work, guessing meaning from context, and learning how words work in sentences. *Comprehension Skills teaches reading skills such as recognizing words and phrases, scanning for information, and making inferences. *Thinking Skills provides practice in recognizing sentence structure and following the logic of ideas.